Morality Needs Intelligence As Will Needs Mind. Intelligence Is Humanism. Camels in The Highest Arctic, Again, Soon. Abstract: Logic and, or, independent observations, show that, considering the present CO2 (and other human made greenhouse gases) density, the High Arctic will be ice free pretty soon (except for the highest mountains, but that’s to be expected). 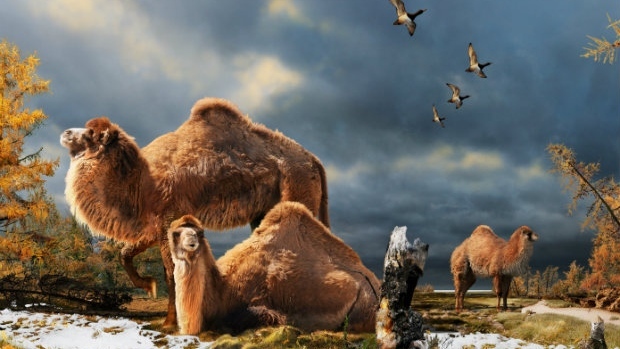 A recently published multi-year study revealed that there were giant camels in the extreme high Arctic, on Ellesmere Island, just west of North-West Greenland, 3.4 million years ago. Their bones show they were apparently 30% taller (and thus twice heavier) than today’s largest camels. Camels originated in North America. What is surprising is that the environment of these giant dromedaries (one hump!) was characterized by an open larch forest (represented above), with an average temperature of – 1.8 Celsius, up to 22 Degrees Celsius warmer than today. Whereas GLOBAL Earth temperature was only 2 to 3 degrees C warmer. So here we see an Artic Temperature Multiplier of roughly ten: the Arctic was ten times warmer than the Earth average. Interestingly, the CO2 density then, 3.4 million years ago, was the same as now, 400 ppm. Hence the 2 to 3 degree C Global Warming experienced then is what we are heading towards presently: a High Arctic which was ice-free in summer. As I have advocated, years before anybody else, that two degrees Celsius of warming is too much. (See 2C IS TOO MUCH.) The main argument there was that observations show a rise of five degree Celsius in Polar Regions whereas the planet’s average has been only .5 degrees. So we observe a multiplier of ten, as I called it. I admitted that this rough reasoning was simplistic: an obvious objection from Very Serious People would be that the observed rise in temperature, so far, was actually not 5 degrees Celsius in the Polar Regions, but less than that. I will give several independent reasons to object to the objection. However, what is certainly true is that rises of 5 degrees Celsius have been observed for extended periods, in the Polar Regions. And that’s all what matters: once ice has melted, that’s it. That, an extended temperature rise, plus a wind, is how the Larsen B iceshelf suddenly collapsed in Antarctica (this was observed by automated machinery set in the area prior to the collapse; there was a foehn of 100 km/h bringing a temperature of 15 C or so, for a few days). Official observations are more modest: Polar Regions are warming at TWICE the average rate, say the official experts (the IPCC). However the latest explicit measurement found 4 times that rate in extensive areas (such as the Yukon). Let’s make a little computation to decide whether officialdom (twice the rate) is right. Or whether my apocalyptic prediction is closer to the truth, as I claim it is. Say the Earth temperature is 10 Celsius at 45 degrees latitude (10 C is the Earth’s average temperature, 45 degree is the average latitude). Say the permafrost is at the Arctic Circle (in some parts it’s north of it, in others, south, depending upon complicating factors such as oceanic climate, or snow cover… the latter acting like a warm blanket…). The Polar circle is at 66 degrees. That makes it ¾ of the way from the equator. Thus one loses 10 degrees Celsius in 21 degrees of latitude. That corresponds to 10 degrees C in 2,300 kilometers. If the temperature rose at twice the rate in the Polar regions, and the average Earth temperature rose two degrees Celsius, it would rise by four degrees there (something as I said which as nearly being already observed, say in the Yukon, not exactly a small place). That means the permafrost would go north by 1,000 kilometers, or about ten degrees of latitude. However, from what we observe, about four times the rate of warming in the Arctic relative to the average rise, one would gain 20 degrees of latitude, or so. 66 + 20 is roughly 90 (degrees of latitude)Therefore the ice will run out of planet. And, with existing technology, there is nothing we can do. (Or imagine we could do in the future.) Hence the interest to cut down on CO2 production. Once the ice, in particular the sea ice is gone in summer, the region will absorb much more heat, and its temperature will quickly gain the twenty degrees Celsius of temperature it used to enjoy in the warm Pliocene. Share this: Please do share, ideas are made to spread and enlighten! This entry was posted on May 4, 2015 at 10:57 pm and is filed under Catastrophe, Climate Change, CO2, Global Warming. You can follow any responses to this entry through the RSS 2.0 feed. You can leave a response, or trackback from your own site. I say that I predicted that the mega blizzard would be possible in this year and, if not happened this year, and in the near tem and long term future. I had a vision that the most powerful tornado that stretch from the Mother Earth’s atmosphere to the ground below. Then the girl stand before me opened the door and then suddenly the tornado send the powerful wind while it was spinning. I recommended that you guys go and buy the DVD movie called “The Day After Tomorrow” and learn the lessons of Climate Change from that film. I hoped that you guys would understand what I talked about.